I never get tired of butterflies, they are beautiful and fascinating and a great tool to learn about life cycles. 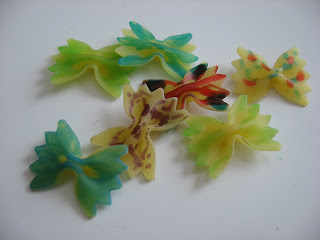 This craft came about because I was using this pasta to make dinner last night . 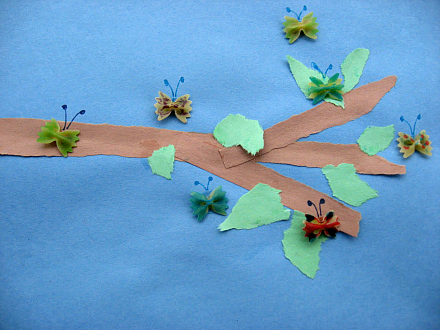 Dinner was a hit and I love how this turned out too.You could absolutely do this with younger children I would simply dye the pasta first, and either draw a branch or just skip the branch all together and make a butterfly only 3D collage! Gather your materials. 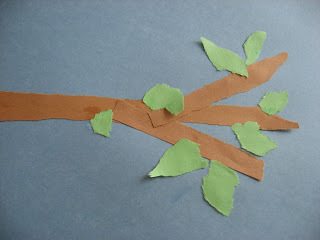 You will need 3 pieces of construction paper ( blue, brown and green) large scrap pieces would be great for the brown and green. You will also need bow tie pasta, markers and glue. 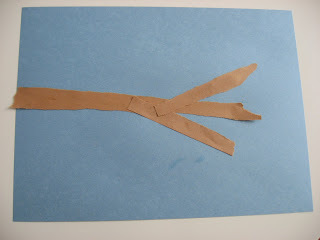 Start by ripping your brown paper to make a branch. Lay it out on the blue paper before you glue it down.Glue it down. 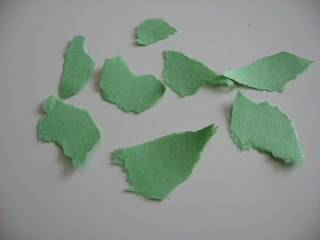 Rip your green paper into little leaves. Glue on. 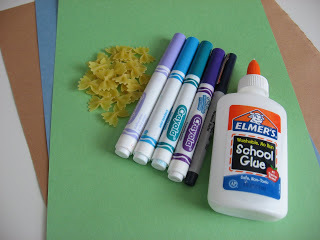 Color your pasta with the markers. I like the challenge of drawing on something so tiny, it’s a great fine motor builder. That said if this is too frustrating dye the pasta before hand or simply leave them plain. 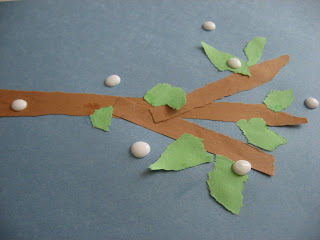 Add glue to your branch. 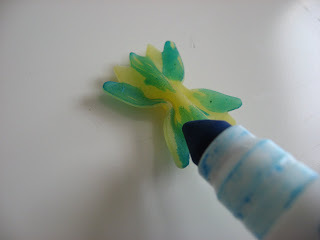 Add your antennae with a marker. Let dry. Your timing could not be better. 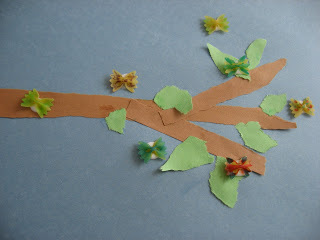 We are waiting for our butterflies to emerge from their chrysalides and we have been doing some butterfly crafts. We will definitely try this. Thanks. Oh what a fun activity! 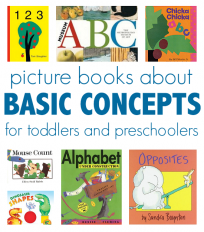 My daughter would love this! The butterflies are so cute. We will definitely make this craft! 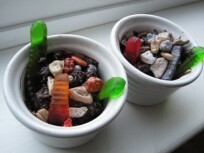 I so love this and the kids will have so much fun with it!! 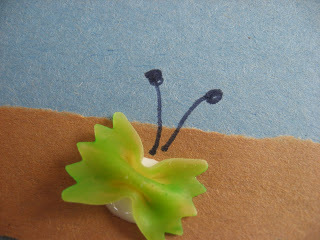 You can also use an orzo, ziti and a shell pasta for a caterpillar and chrysalis and make the whole life cycle! My Gracie loves butterflies. She will adore making this project. Thank you!!!! How fun and cute! One of these will look great hanging on my fridge! Definelty have to keep this one. I should just print out your whole blog and add it to my binder! .-= Ann W.´s last blog ..ConAgra Foods–Coupon Booklet with $17 in savings =-.